No, I didn't spend the day at Disneyland :-) Although, that would have been cool! The other day on Marita's Southern Valley blog she had been talking about fading borders in one post, and in another how blogs had given her the opportunity to make new friends worldwide. I was reminded of a postcard I had made last year when my "art-sister" Linda and I did a summer postcard swap we called Archaeological Digs. Linda came up with this groovy idea that we had to 'dig' from our collected stashes of art materials to create postcards...no running out to buy new stuff. Since Linda and I are both ephemera freaks the challenge wasn't all that difficult...but it sure was FUN! which certainly reflects the discussion on Marita's blog. The postcard was made with a piece of cardstock that I stamped with a rubber stamp image of an old map...I found a textured wallpaper sample that I painted over to give it an old world look. 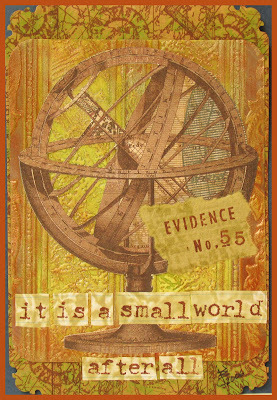 In my bits of pieces of ephemera I found an old world globe...using an X-acto knife I cut out some portions so the textured wallpaper behind it would be exposed. Finding a small scrap of torn paper I 'aged' it using an ink pad and stamped EVIDENCE No. 55. How many of my readers agree that blogging is bringing us all closer together and making our world 'smaller' ? This is a wonderful piece!! And...yes, it is indeed a smaller world through blogging. You and I found each other and discovered that we have most likely crossed paths "in real life". Now that, my dear friend, is a small world!! Thanks Kim, and I agree...is that COOL or what?!? It's even cooler in person! Yes, I'm being a brat. LOL! I loved that postcard exchange we had. It's fun to get something other than bills or, as in my case, boring junk mail. Jolene and I also crossed paths in our real lives as we traveled a common street to visit our grandmothers. Yep, it's a small world all right. With all the paths I've crossed with people you would think I got around a lot :) But 'tis true, Linda and I HAD to have crossed path's at some point...and I think the 'connection' we have proves it! beautiful collage jolene and it represents 'the small world' theme at its best. imagine, just a few weeks ago i didn't know about blog adventures, taking me to all kinds of new horizons, making some new friends far away and around the globe. the world is getting smaller every day...i do hope it will bring some enlightning into the many dark shades that still surround us all. jolene, when you're waking up a very good morning to you. i'm already at my lunch ;) small world after all? please check my blog today...new challenges ahead. I like your small world. Marita sent me! rochambeau and elizabeth...thank you both so much! It is so great that Marita has brought us all together! I love all the connections and friends I have made through blogging. So many wonderful, creative people (like yourself!) who I wouldn't have met otherwise! Very cool!! Where Do The Years Go...? Hey Kids, Do You Know What Day It Is?